I have a 2008 Shelby Mustang GT 500. There is a small noise coming from the supercharger. When I take my car to the Ford maintenance service center, they said my air filter intake makes these effects in my supercharger and this is what makes this noise. Yes, it can make some noises. 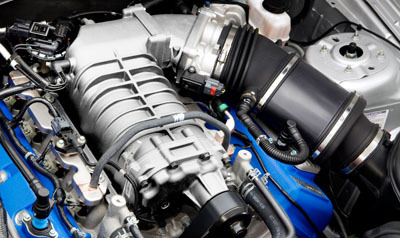 The sound of the air running through the intake plenum into the supercharger can make a noise. Different air filters can affect that sound too. In particular, if you have a high flow air filter, it can cause the sound to be louder. In the old days, some people used to flip the air cleaner lid upside down on engines with a carburetor, to make this intake sound louder (it made it seem like you had more power. The GT500 Mustang supercharger also has a sound, caused by the rotors inside turning, which can be heard when you rev the motor or hit the gas pedal hard. This may also be the sound you are hearing. If you have a bearing problem with the supercharger on the GT500, you would hear a kind of crunching, or grinding sound, almost like you were slowly driving on a gravel road. This sound starts out very small, but gets louder over time.